21st-century schools need 21st-century technology. The biggest question about technology and schools in the 21st century is not so much "What can it do?" but, rather, "When will it get to do it?" We all know life will be much different by 2100. Will school? How close will we be to Edutopia? Until recently, we have mostly been dabbling with technology in our schools: A few Apples here. A PC there. Random creation of software by teachers and other individuals -- some very good, much bad. A few edutainment disks. Dabbling. When a new technology appears, our first instinct is always to continue doing things within the technology the way we've always done it. People still illuminated the first printed Gutenberg Bibles by hand. Television pioneers set up single cameras in "great" theater seats. The result was pretty much like what came before; some elements may have been lost, but the results were certainly cheaper, and far more efficient. That is almost exclusively what we now do with educational technology. We use it mostly to pass documents around, but now in electronic form, and the result is not very different from what we have always known. People certainly are putting courses, curricula, and lesson plans online. This trend is important, but it's hardly new -- it will be new only when those courses, curricula, and lesson plans are very different and technology influenced, when they are set up so they can be found and mixed and matched easily, when they are continually iterated and updated, and when the kids have a big say in their creation. Certainly, systems for maintaining records and assessment online, such as PowerSchool, a Web-based student-information system from Apple (and similar products from Pearson School Systems and Chancery Software), have emerged, but the records and assessments we ask for and keep, for the most part, haven't changed. I would even include writing, creating, submitting, and sharing work digitally on the computer via email or instant messaging in the category of doing old things (communicating and exchanging) in old ways (passing stuff around). Is there educational progress, though? It appears that students who write on a computer turn in longer and higher-quality assignments than those who compose by hand, even though it's still writing. A middle school principal in Maine (where all middle school students are supplied with computers) proclaims that the debate over handwriting is finally over -- all assignments must be keyboarded. You can mourn the passing of handwriting if you must; the kids certainly won't. If they are writing better and more detailed papers, yes, there has been progress. But new technology still faces a great deal of resistance. Today, even in many schools with computers, Luddite administrators (and even Luddite technology administrators) lock down the machines, refusing to allow students to access email. Many also block instant messaging, cell phones, cell phone cameras, unfiltered Internet access, Wikipedia, and other potentially highly effective educational tools and technologies, to our kids' tremendous frustration. Even where technology has not been blocked, much of the digitized educational materials and records are just examples of using computers to collect old stuff (such as data or lesson plans) in old ways (by filing). There are some educational benefits, though, including allowing teachers to access data more easily and parents to do so more extensively. Recently, a number of our schools (a very small number) have entered the stage of doing other old things in new ways. Now, it begins to get a little more interesting. "I used to have to tell my students about phenomena, or have them read; now I can show them," says Jim Doane, a science teacher at Scarborough Middle School, in Scarborough, Maine. When we begin adding digital demonstrations through video and Flash animation, we are giving students new, better ways to get information. In a growing number of simulations, ranging from the off-the-shelf SimCity and to Muzzy Lane's Making History to MIT's experimental Revolution and Supercharged, students -- even elementary school children -- can now manipulate whole virtual systems, from cities to countries to refineries, rather than just handling manipulatives. In Education Simulations's Real Lives, children take on the persona of a peasant farmer in Bangladesh, a Brazilian factory worker, a police officer in Nigeria, a Polish computer operator, or a lawyer in the United States, among others, experiencing those lives based on real-world statistical data. Riverdeep's School Tycoon enables kids to build a school to their liking. With these tools, students act like scientists and innovators, rather than serve as empty vessels. They arrive at their own conclusions through controlled experimentation and what scientists call enlightened trial and error. Still, our best teachers have always used interactive models for demonstrations, and students, like scientists and military planners, have been conducting simulations in sand, on paper, and in their heads for thousands of years. So, though some observers trumpet these uses of technology as great innovations, they are really still examples of doing old things in new ways. But there are many more old things children are doing in new ways -- innovations they have invented or adopted as their preferred method of behavior -- that have not yet made their way into our schools. These include buying school materials (clothes, supplies, and even homework) on eBay and the Internet; exchanging music on P2P sites; building games with modding (modifying) tools; setting up meetings and dates online; posting personal information and creations for others to check out; meeting people through cell phones; building libraries of music and movies; working together in self-formed teams in multiplayer online role-playing games; creating and using online reputation systems; peer rating of comments; online gaming; screen saver analysis; photoblogging; programming; exploring; and even transgressing and testing social norms. An important question is, How many of these new ways will ever be integrated into our instruction -- or even understood by educators? If we want to move the useful adoption of technology forward, it is crucial for educators to learn to listen, to observe, to ask, and to try all the new methods their students have already figured out, and do so regularly. Two big factors stand in the way of our making more and faster progress in technology adoption in our schools. One of these is technological, the other social. Many groups are working on solutions to the one-to-one problem, and this approach is being implemented in several places, including Maine; Vail, Arizona; Florida's Broward County Schools; and the Lemon Grove School District, in Lemon Grove, California. Those who cite cost as a barrier to implementing one-to-one computing should know that the prices of these devices, as with all technology, are falling dramatically. Although the expense is often estimated at $500 to $1,000 per unit, this year, according to longtime computer visionary Nicholas Negroponte, we will see a basic laptop computer for roughly $100. A second key barrier to technological adoption is more challenging. Schools (which really means the teachers and administrators) famously resist change. Though some observers, including multiple-intelligences guru Howard Gardner, point to schools as the "conservators" of our culture, and therefore instinctively conservative in what they do, the resistance comes more from the fact that our public school system has evolved an extremely delicate balance between many sets of pressures -- political, parental, social, organizational, supervisory, and financial -- that any technological change is bound to disrupt. For example, such shifting certainly initially means more work and pressure on educators, who already feel overburdened. In the past, the pressure against disruption has always been stronger than the pressure for change. 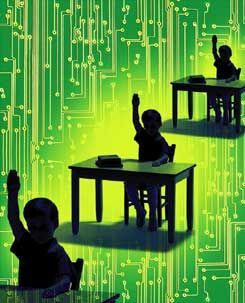 So, as new technologies -- from radio to television, from telephones to cell phones, from cameras to video cams, or even Wikipedia -- have come down the pike, American public schools have fearfully stood ready to exclude them. Change hasn't happened. But resisting today's digital technology will be truly lethal to our children's education. They live in an incredibly fast-moving world significantly different than the one we grew up in. The number-one technology request of today's students is to have email and instant messaging always available and part of school. They not only need things faster than their teachers are used to providing them, they also have many other new learning needs as well, such as random access to information and multiple data streams. These "digital natives" are born into digital technology. Conversely, their teachers (and all older adults) are "digital immigrants." Having learned about digital technology later in life, digital immigrants retain their predigital "accents" -- such as, thinking that virtual relationships (those that exist only online) are somehow less real or important than face-to-face ones. Such outmoded perspectives are serious barriers to our students' 21st-century progress. Many schools still ban new digital technologies, such as cell phones and Wikipedia. Even when schools do try to move forward, they often face antitechnology pressure from parents demanding that schools go back to basics. Many teachers, under pressure from all sides, are often so afraid to experiment and to trust their kids with technology that they demand extensive training before they will try anything new. All these factors impede even the many schools trying to change. With very few exceptions, our schools have not been physically designed for computers. Much time in our schools' 45-minute instructional periods is often wasted in computer setup and shutdown. Teachers are often unsure about how to integrate technology in their lesson plans and, often, administrators have little, if any, guidance to give them. In many places where technology could liberate teachers most, such as automatic grading of homework and tests, automation has been neglected. Adding digital technology is generally disruptive to what schools and teachers do, and the pressure of high-stakes testing only exacerbates this problem. How, then, do we move forward? First, consult the students. They are far ahead of their educators in terms of taking advantage of digital technology and using it to their advantage. We cannot, no matter how hard we try or how smart we are (or think we are), invent the future education of our children for them. The only way to move forward effectively is to combine what they know about technology with what we know and require about education. Sadly, in most cases, no one asks for their opinion. I go to conference after conference on school technology, and nary a student is in sight. I do hope that, after having pointed this situation out a hundred times or so, I will find that it is starting to change. Students will have to help, and we will have to think harder about how to make this happen. For the digital age, we need new curricula, new organization, new architecture, new teaching, new student assessments, new parental connections, new administration procedures, and many other elements. Some people suggest using emerging models from business -- but these, for the most part, don't apply. Others suggest trying to change school size -- but this will not help much if we are still doing the wrong things, only in smaller spaces. What we're talking about is invention -- new things in new ways. Change is the order of the day in our kids' 21st-century lives. It ought to be the order of the day in their schools as well. Not only would students welcome it, they will soon demand it. Angus King, the former governor of Maine who pushed for one-to-one computing in that state's schools, recently suggested our kids "should sue us" for better education. I suggest that every lesson plan, every class, every school, every school district, and every state ought to try something new and then report to all of us what works and what doesn't; after all, we do have the Internet. Some people will no doubt worry that, with all this experimentation, our children's education will be hurt. "When will we have time for the curriculum," they will ask, "and for all the standardized testing being mandated?" If we really offered our children some great future-oriented content (such as, for example, that they could learn about nanotechnology, bioethics, genetic medicine, and neuroscience in neat interactive ways from real experts), and they could develop their skills in programming, knowledge filtering, using their connectivity, and maximizing their hardware, and that they could do so with cutting-edge, powerful, miniaturized, customizable, and one-to-one technology, I bet they would complete the "standard" curriculum in half the time it now takes, with high test scores all around. To get everyone to the good stuff, the faster kids would work with and pull up the ones who were behind. In other words, if we truly offer our kids an Edutopia worth having, I believe our students will work as hard as they can to get there. So, let's not just adopt technology into our schools. Let's adapt it, push it, pull it, iterate with it, experiment with it, test it, and redo it, until we reach the point where we and our kids truly feel we've done our very best. Then, let's push it and pull it some more. And let's do it quickly, so the 22nd century doesn't catch us by surprise with too much of our work undone. Marc Prensky, founder and CEO of Games2train, is a speaker, writer, consultant, and game designer. He is the author of Digital Game-Based Learning and the upcoming Don't Bother Me, Mom, I'm Learning.